Did you know a leasing company can extend your lease without your permission? 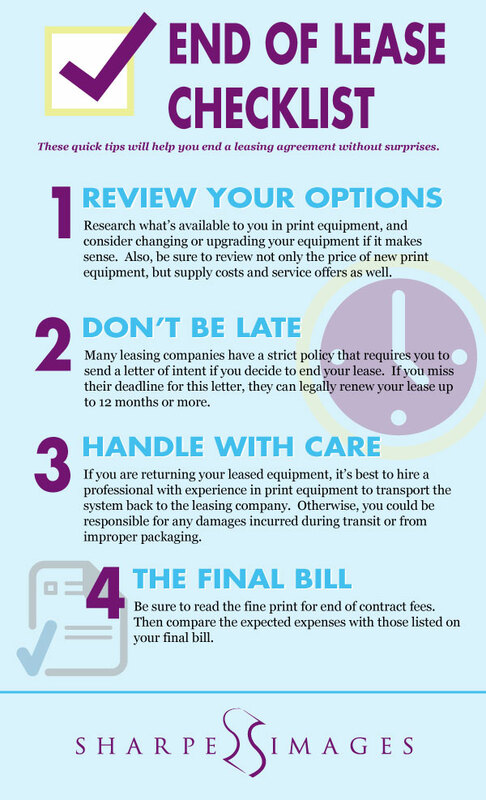 Here’s a great checklist to avoid common leasing traps and to help you negotiate your next print equipment lease. If you are considering a change in your print equipment, our representatives are available to help. We’ll do a thorough cost analysis of your current printing habits and equipment costs and then recommend the right equipment for your particular business and budget. We’ve formed partnerships with some of the best leasing companies around so we can even help you find flexible financing solutions. Contact our leasing office to request a custom quote. Great information for anyone interested in leasing equipment. We'll guarantee that our system will perform to your satisfaction or we'll replace it. Quickly and Easily. Plus, if you have down time, we'll handle your printing in our offices at your contract price.